Introducing Picador's beautiful new editions of Lian Hearn's bestselling trilogy - a journey of revenge and treachery, honour and loyalty, beauty and passion. 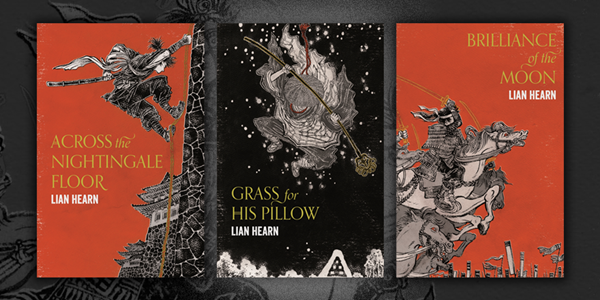 Lian Hearn's bestselling Tales of the Otori trilogy, set in a mythical, feudal, Japanese land, tells the intense love story of two young people against a background of warring clans, secret alliances and lightning swordplay. Metadata Executive, Elle Jones, explains why Lian Hearn's epic tales of revenge and treachery, honour and loyalty, are loved by readers across the world. I first discovered Lian Hearn in an Edinburgh Waterstones when I was seventeen. I stumbled upon Across the Nightingale Floor – a title that, little did I know, is cleverly structured to resemble a haiku alongside the sequels, Grass For His Pillow and Brilliance of the Moon. Ever since, they have remained as some of the most-loved, oft-reread, books on my bookshelves. The original Tales of the Otori trilogy delves deep into an imaginative world of tyrants, injustice and mystic assassins; epic storytelling set in the enthralling world of feudal Japan. The recently published prequels, Emperor of the Eight Islands and Lord of the Darkwood, take the reader further back, to the very origins of the seemingly magical Tribe of ninja-style assassins, and the legendary sword, Jato. Like the earlier Otori novels, they have the displaced at their core; women struggling to retain their rights and protect their lands, orphans lost in the struggle for power. It’s these outsider characters, unique and compelling, that pull me back into the world of the Otori again and again. Magic, fate, love and war all bind together to drive the question: who will inherit the Eight Islands? Follow Elle Jones on instagram @ellefjones for more beautiful books. The first book in the Tales of the Otori series. In his palace, warlord Lord Iida Sadamu, surveys his famous nightingale floor. Its surface sings at the tread of every human foot, and no assassin can cross it. But sixteen-year-old Otori Takeo, his family murdered by Iida's warriors, has the magical skills of the Tribe - preternatural hearing, invisibility, a second self - that enable him to enter the lair of the Tohan. The second book in the Tales of the Otori series. The fate of the young lovers Otori Takeo and Shirakawa Kaede hangs in the balance. Takeo has pledged his life to the secret Tribe. His supernatural skills make him their most deadly assassin. But he must deny the solemn oath of vengeance he made, his adopted birthright of wealth, land and power - and his love for Kaede. Kaede, heiress to vast lands, is now the valuable pawn of ruthless warlords. She must assert her place in a world of all-powerful men - who must never suspect the dangerous secret she hides. In third book in the Tales of the Otori series. Takeo and Kaede, still only teenagers, are married, but the implacable forces of destiny that rule their lives tear them apart. Takeo, a battle-hardened warrior at the head of an army fighting for his Otori birthright, has his legendary magical powers tested to their limits against the invisible assassins of the Tribe. Kaede, determined to reclaim her own lands, is treacherously betrayed and forced into marriage. Their love will survive until death - but death, in this savage, beautiful world, is always only a moment away. >>>Read Lian's introduction to her epic new series, Emperor of the Eight Islands.